Who’s Lying Down in Your Heart? 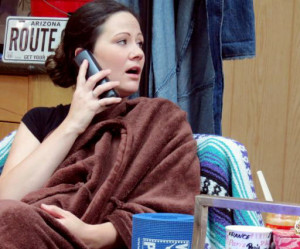 Eva Poole-Gilson’s original play to be staged at Edison Theater May 17. Local playwright Eva Poole-Gilson. Photo by Lunch. In some respects, Eva Poole-Gilson’s eyes say more than her pen could ever say. Her eyes remind me of Andrea Mead Lawrence’s. They are eyes that have seen more than you know, and they are eyes that have known their fair share of heartache. 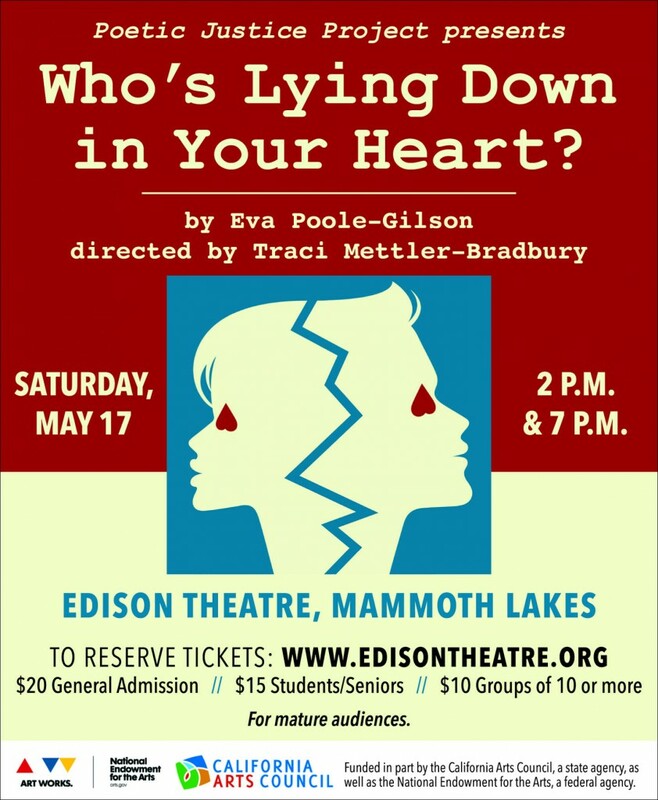 Poole-Gilson’s play “Who’s Lying Down in Your Heart?” comes to Mammoth next Saturday for two shows. The play is being produced by the Poetic Justice Project and funded in part by the California Arts Council and the National Endowment for the Arts. The only theater company of its kind in the state, Poetic Justice League, based in Santa Maria, features casts of formerly incarcerated actors in works that examine crime, punishment and redemption. Tobola, says Poole-Gilson, was Director of an Arts Program at a men’s prison before founding the Poetic Justice League. Poole-Gilson wrote this play four years ago for a cast of 12 actors. Next Saturday, you will see three live actors while eleven actors appear via video installation, making it a live theatre/film hybrid. For example, the two women playing the sisters in the upcoming production are actual sisters. They are also younger than Poole-Gilson had envisioned. “I had written them as widowed,” she said. Where did she draw the inspiration for the work? The play is about finding a positive way through in the face of obstacles, and hopefully, there is a redemptive ending, she said. Poole-Gilson grew up the youngest of four children in Wisconsin on the shores of Lake Michigan. She moved to the Eastern Sierra in 1976 and currently teaches poetry and public speaking courses at Cerro Coso College in Bishop. 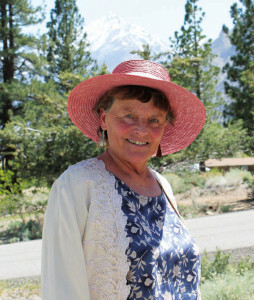 She also teaches poetry to fourth graders, primarily in the Inyo County schools. Veronica doesn’t want to hear any of it. Despite her cold façade, she does listen, and the two reveal their family-of-origin turmoil, still snorting with laughter at some of their past shared memories and holding their breaths in the recounting of certain newly uncovered traumas.